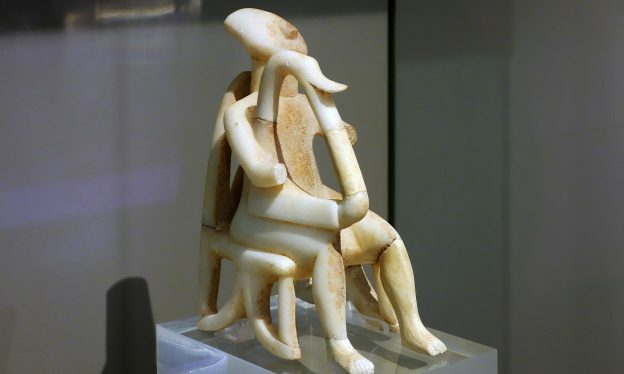 The art of the Cycladic islands, the Minoans (on Crete), and the Mycenaeans (on the Greek mainland). The Cyclades is a group of about thirty small islands in the Aegean Sea. c. 3000 – c. 1100 B.C.E. Minoan culture is characterized by the building of remarkable palaces (really administrative centers) decorated with colorful frescoes. c. 1600 - 1100 B.C.E. Centuries before the classical period of ancient Greece, the peoples of this region built sophisticated palaces, and tombs filled with finely-crafted gold objects.